“And it seemed to me that Dante’s face was a map of the world. A world without any darkness. Aristotle and Dante Discover the Secrets of the Universe is an elegantly written coming of age story, one that’s truly unique in the realm of YA literature. During one profound summer day, Ari and Dante meet and quickly become the closest friend they each have in the world. But when tragedy strikes and subsequent events occur, Ari and Dante’s friendship is put to the test. Set in the 1980’s, Sáenz’s emotional roller-coaster of a novel opens readers’ eyes to a world where openly discussed topics were once tabooed and what happens when you don’t fit into the “norm” that society has dictated for us. 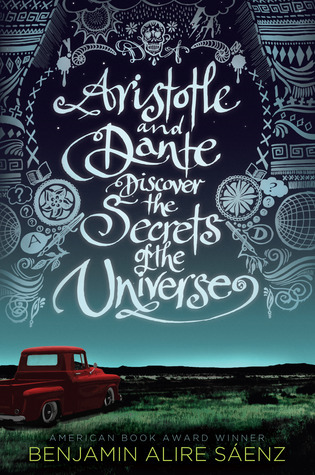 An addictive story with tremendously brilliant characters, Aristotle and Dante Discover the Secrets of the Universe is nearly impossible to put down! Another reading experience that illustrates why I follow book blogs and decided to start my own. After seeing an abundance of reviews on Aristotle and Dante Discover the Secrets of the Universe in the book blogging world in 2017, I decided to add it to my TBR list and give it a go. This marvelously stunning novel’s impeccable beyond belief. Following Ari’s POV, Sáenz’s novel explores the essence of the ups and downs of “teenhood”. Within two days, I finished this book and grew eager for the sequel…I don’t know how the readers who read this back in 2012 have been able to patiently wait for the sequel. CONTENT & TRIGGER WARNING: This book covers Post Traumatic Stress Disorder (PSTD), mental health (i.e. depression, anxiety), substance use (minimal). coarse language (minimal) and violence. This is the first of Sáenz’s work I’ve ever read, and it won’t be the last. The narration, the dialogue…the entire novel felt like a gigantic piece of poetry. Beyond poetry, I don’t think I’ve ever read a piece of literature where you can tell that the author carefully considered EVERY word used in the novel. Sáenz’s book’s also remarkably descriptive as it truly captivates not only the scenery and character appearances, but it also effortlessly conveys Ari’s inner demons and struggles to the reader. The setting takes place in El Paso, Texas in the late 1980’s. In comparison to today’s society (though we still have room to grow), topics such as homosexuality and mental health weren’t as greatly discussed with the general populace; this is GREATLY emphasized in the novel and is one of the major antagonistic elements that Ari and Dante and other characters face throughout the plot. Sáenz also made sure to focus on the small details that characterize aspects of the 1980’s; this includes popular songs and music artists, the fashion style, certain popular sayings and phrases, and even the small details such as the wide use of cigarettes. The best element of Sáenz’s novel is that the characters are constantly developing and growing, transforming by the end of the novel in comparison to chapter one. Ari and Dante, the two protagonists, are so beautifully flawed and real…you forget that they’re fictional characters. Sáenz really illustrates what it’s like to be a teenage, slowly trying to figure out who you are and where you fit in this completely vast world. Ari, the first person narrator, is complex not only to the readers and other characters but to himself. Unable to decipher and express his own thoughts and feelings, Ari struggles greatly with communication. Though this was hard emotionally at times since Ari struggles throughout most of the novel with a form of depression and expressive issues, it was great to see his development by the end of the novel. In comparison, Dante’s rather comfortable with expressing his emotions and ideals to the world. It’s great to see these two dramatically different people grow close, especially as Dante helps Ari discover himself and open up to those close to him. Ari and Dante’s parents, though very different from one another, are also fantastic characters. Just like Ari and Dante, Sáenz shows how even adults go through mental strife and need help from time to time. Now…the thing authors have to consider when they decide to write novels encompassing heavy and triggering topics is how to do this with “tact”. I’ve encountered a number of novels that have NO trigger or content warning yet dive into such topics so bluntly that it can even make readers who aren’t struggling in those areas have a hard time mentally and emotionally. Sáenz has learned the art of tactfulness and grace; he elegantly yet accurately discusses issues regarding soldiers suffering PTSD, mental health and depression, self-identity crisis, emotional detachment, and much more. It never felt as though Sáenz was trying to discuss too many issues, though there’s A LOT going on in this novel. Not everything is tied off with a neat little bow by the end, but I would’ve been disappointed if it was; it’s much more realistic this way. As a warning, Ari and his family have a lot of mental health issues occurring throughout the entirety of the story. If you’re someone who’s going through some serious mental health issues currently, this may not be the best choice for you. You know you’ve just read a REALLY good book when it’s all you can think about…that’s how I feel about Aristotle and Dante Discover the Secrets of the Universe. It’s been a week and I still haven’t been able to pick up another book since my thoughts are still all about this beautiful piece of literature. Ari and Dante’s bond’s magical, something we all aspire to have in our own relationships; they aren’t perfect and they encounter struggles, but Ari and Dante always find a way to work with one another’s weaknesses and find ways to grow both individually and together. I have nothing but praise for Sáenz’s book. Ooh, all this resurgence of the love for this book is making me want to re-read it. I even bought my own copy recently, too. I think it’s one of those books which will remain in our hearts for a long, long while. It’s absolutely wonderful! I want the sequel SO bad!!!! YES this one is fantastic! It’s one of the first books I read back when I first found the wonder that is Goodreads and it remains one of my favorite books ever! I am definitely due a reread! Fantastic review and I LOVE the way you structured it! Thank you so much love!! ❤ I've been playing around with the layout and I REALLY like the pros and woes list. You and a few other bloggers do something like that, which is where I got the idea. I find it easier to discuss everything. I fell absolutely in love with this book. I'm planning to read another one of his works soon. I don't want to wait for the sequel!! I need more Ari and Dante!! I added this book to my TBR a while ago and I still need to read it – it sounds so good but I can’t find it anywhere. Awesome review! I found it at Chapters! You can probably order it online. If you’re looking to get it from the library, I’d be pretty shocked to see it not available to loan! It’s been a couple of years but I think it’s still pretty popular. No, it’s definitely not a weird you thing 😛 I totally get that. I definitely read this book in the comfort of my room…I didn’t want to cry in front of people ha-ha! It didn’t make me sob, but my eyes definitely watered. Thank you so much! I really appreciate the feedback. I’ve been going through different review layouts over the past year and a half, but I think I finally found the layout that works best for me and it works for a variety of book types.